I feel like I should explain PUBG over the others. Firstly, I have played none of these. Next, MHW, Odyssey, and Hitman 2 all immediately lose in my opinion because I do not agree with their strategy on Denuvo. Kingdom Come: Deliverance got ripped to shreds by Yahtzee. But the deciding factor for me is that PUBG presented what I consider a new concept and changed the landscape of gaming. My personal nomination isn’t on there, so I have to choose between 5 that I don’t really think fit the bill. Well, the Alt-History nomination was for Wolf II (which takes the awesome Wolfenstein universe and utterly butchers it) so I honestly felt like seeing that game as a nomination was a huge slap in the face. I would have given it to ANY other Wolfenstein game. ANY but that. Well, it was up to whichever game got nominated-- in which case, I have no clue how Wolf II won an award. It just doesn’t make sense to me. It’s not the only terrible decision (Fallout 4 VR was a $60 re-release of a $60 game that locked all DLC and doesn’t even do the bare minimum to adapt the game to a VR playstyle leading to an exploitable, barely-functional busted mess of a game where even the vanilla content is falling apart at the seams). It just stood out to me as one of the more tasteless ones. Fallout 4 VR was right when I was dying for more killer apps. I really wanted to love Fallout 4 with how much I saw friends playing it despite how little I cared for the game, and I figured-- maybe VR would be enough. The red flags kept on showing up, but even until launch I retained hope that… hey, maybe it’ll be alright. Watching the game utterly fall to pieces over three hours, entertaining as it was, really sucked. Even ignoring the locks on DLC, the common VR exploits of cha-cha-ing through locked doors and lockpicking by sticking your hand through a lock and opening from the other side… even as a basic game, it doesn’t function! The aiming barely works, the Pip-boy itself is completely broken, even WHEN it works you aren’t allowed to use it in the way you would hope, and it won’t be long before you clip yourself into some stupid situations. The patches are mostly there to deal with the utter lack of QA, like when you get to that big setpiece with the power armor only to find that the minigun’s ammo counter isn’t even visible-- it’s clipping through the gun, and it’s not the only gun to have this kind of problem. Its only saving grace is that it wasn’t as bad as Doom VR. I’m all for smashing hi-tech regimes with stupid weapons, but we also got a Red Faction Guerrilla remaster this year… so I’m a bit spoiled for choice. It would have been nice if Bethesda at least tried with Wolf II, though. My own Alt History vote went to Civilization VI. It’s hard to argue with your world head-canon shenanigans being some of the most surreal, convoluted, and entertaining worldbuilding around. Oh, and there’s Genocidal Warlord Gandhi. Can’t argue with that. 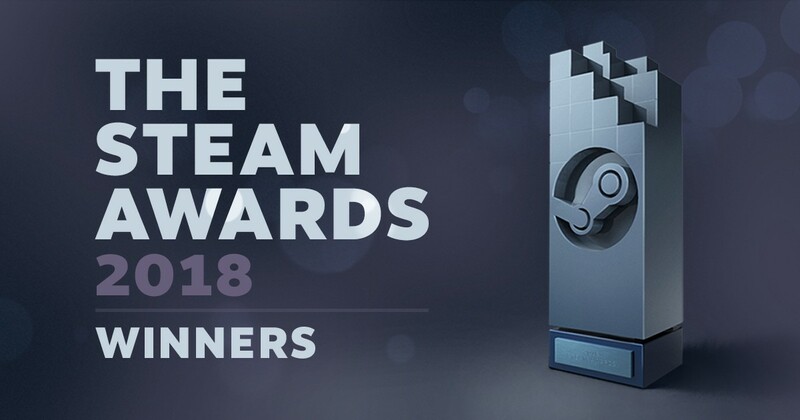 Tune into http://Steam.TV/SteamAwards on February 8th @ 10am PT to watch the first-ever broadcast of the Steam Awards results, including special messages from the winners. I’d much rather play a game i enjoy instead of watching games i don’t enjoy win awards. I’d rather just read who won than watching a show where they add a bunch of suspense and special messages. There’s a reason I don’t watch the Game Awards, it’s a 3 hour long show with 15 minutes of actual content. well I’m sure they will have a list of the winners after the show. If not, someone will make one. The Steam Community has spoken and we are proud to announce the winners of this year's Steam Awards. Thanks to everyone who participated, see you again next year! How did PUBG win game of the year? At least CD Project Red got the recognition they deserve. Yeah i couldn’t believe they won Game of the year either, & the only thing that i voted for and won was CD Projekt Red. I can’t believe u guys even check who won this joke of an “awards” which is based on nothing relevant at all. PUBG won because it’s Steam’s biggest game. No matter how many review bombs get directed at it, it has a fiercely loyal community larger than CSGO or even Dota 2 could ever dream of being. The nominations were overall poor in my opinion, but out of the choices given I’m not really surprised by any of the winners. Oh, except Skyrim VR. I’m 99% certain it was voted up by people who never touched a VR headset in their lives and felt like they had to vote for something. Well not sure what did i expect from steam awards but… PUBG game of the year? sad times to be alive. Though i understand why they still bother organizing this award, I can’t help but feel that it became extremely boring over years. Also… there are only two games made in 2018 in the winner list and one of them is Skyrim VR (there was a rant, deleted) So it’s technically one 2018 game on the list, and it happens to be Odyssey. What a great year for videogames. Yeah, I know, it’s their award. They can do whatever they want to it. But it makes things even MORE boring, and predictable, and conservative. I hope next year they’ll change their ways and make it more about new games. The award could help people see what they’ve missed in the year - instead of just clinging on giants everybody knows about already. They’ve already have their awards. Other games need some spotlight and recognition, too. IMHO.